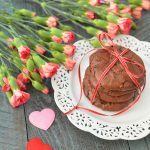 These flourless dark chocolate cookies are extremely rich and are great warmed up and served with a scoop of vanilla ice cream and berries. In a mixing bowl, combine powdered sugar, cocoa powder, and salt. Mix to combine. Place your chocolate chips and butter in your double broiler, mixing every so often while chocolate and butter melt. When your chocolate mix is smooth, turn heat off and let sit for one minute. While the chocolate mix is cooling, add egg whites and vanilla to your dry mix and combine till a creamy texture. Add your chocolate to the mix and combine well. Scoop your mix into little balls and place on a baking mat on a cookie sheet. Once cookies are done, allow them to cool on cookie sheet. Since the cookies are flourless they will break apart if they have not cooled long enough. Enjoy by themselves or warmed with vanilla ice cream!